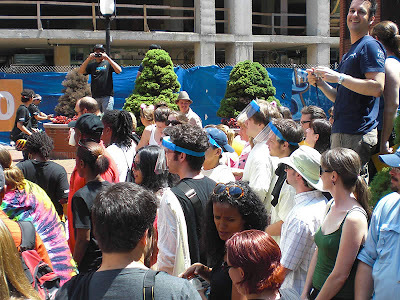 Cluefest is an annual scavenger hunt that takes place in New Haven. We last took part four years ago. 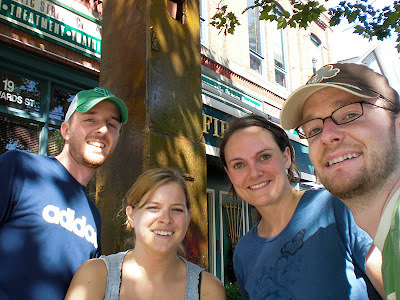 Along with Russ and Steph, we drove around the neighborhoods of New Haven and took part in various activities on this hot and humid day. The rather cryptic clues took us to areas we had never been to before. We took part in horse shoe throwing and a little boxing at a local boxing club. After 3 hours we headed to the finish line for food and drinks. We left early so we never found out who won. It's unlikely that it was us. Here are the teams gathering for the start of the hunt. Here we are in front of a piece of steel from the World Trade Center towers. As with many cities, it stands as a memorial. 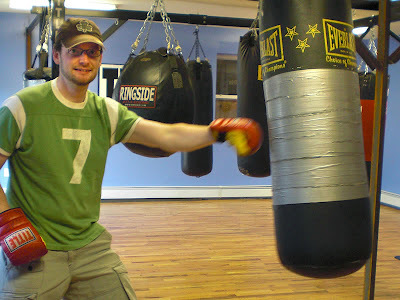 Russ pummels a bag at a local boxing club. 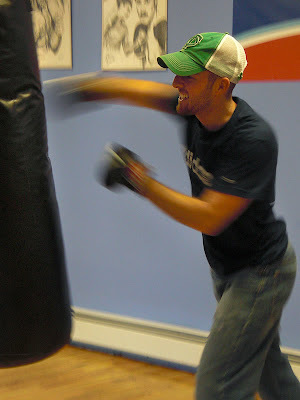 This photo doesn't do my boxing skills any justice. There were some hard hits but somehow Jen didn't photograph those.